See the first Impression of Nokia 9, exclusive on Mobile Review - mobilereview.online - The Ultimate resource for mobile phones reviews, specification, information. The Nokia brand may have entered the Android smartphone market for a little while, but in a short time the brand has added unique users to its smartphone. In the last few months, Nokia has launched strong specifications and great looks and design smartphones which have been very well liked. Discussions on Nokia Tech's upcoming devices Nokia 9 also arise, in which phones are mentioned. But today we have come with the render image of Nokia 9 for tech lovers and Nokia fans. Looking at this render image, you will find information about Nokia 9's unique design and its magnificent look. The first to mention the biggest USP of Nokia 9 is the 5-rear camera sensor on the back panel of the phone. Nokia 9 will be the world's first smartphone with 5 cameras on the back panel. On this phone's rear panel, 7 sensor holes have been given in very beautiful designs. Of these 7 holes, there are 5 camera sensors, a dual-tone LED flash and a proximity sensor. These 7 holes have been installed on the back panel of the best way. The penteta camera in the phone i.e. 5 sensor camera setup will have a telephoto lens with two primary camera sensors, a wide-angle lens and a defy-sensing camera sensor. Like Nokia's other smartphones, Nokia 9 will also have camera sensors of Carl Jesses. The Nokia logo will be present at the back panel of Nokia 9 only under camera setup. The fingerprint sensor will be seen on the back panel of the phone and the Nokia 9 can be launched on glass-sandwich design, which is of a metal frame. This phone can be offered on a 5.9-inch QHD display with a 18: 9 aspect ratios, which will have a very narrow bezel. On the upper right side of the front panel, where the Self camera will be sensor, there will be two other sensors on the left. It is expected that one of these sensors will be the Face Recognition Sensor. 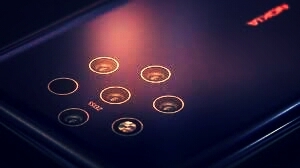 At the same time, due to lack of physical fingerprint sensor in the phone, it is also strongly believed that Nokia will support 9 in-display fingerprint sensors. USB Type-C port is given on the lower panel of Nokia 9. Speaker grill is present in the side of this port. From Type C-Port, where it is clear that this phone will support fast charging technology, Nokia 9 is also believed to be launching it with wireless charging. While the volume rocker and power button are given on the right panel of the phone, the SIM tray is placed on the upper panel. Nokia 9 can be offered on Android's newest version Android 9 Pie, with which this phone will run on Qualcomm's most powerful chipset Snapdragon 845. On behalf of the company, this phone can be launched on 8 GB RAM Macri. The internal storage of 128 GB can be given in the phone. Hope this phone will be water and dust inhibitor. For power backup Nokia N71 can get 4,150 mAh battery. Nokia's proprietary tech company HMD Global has so far not given any official information about Nokia 9. 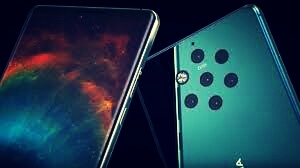 The phone will knock on the tech platform and the company's official announcement and confirmation information is being waived for the specifications and price of this phone. However, it is certain that Nokia 9 will be the most unique and unique to all smartphones launched in terms of look and design.